Everyone knows what an anchor is, a device that is used to hold a boat in place while it’s on the water. 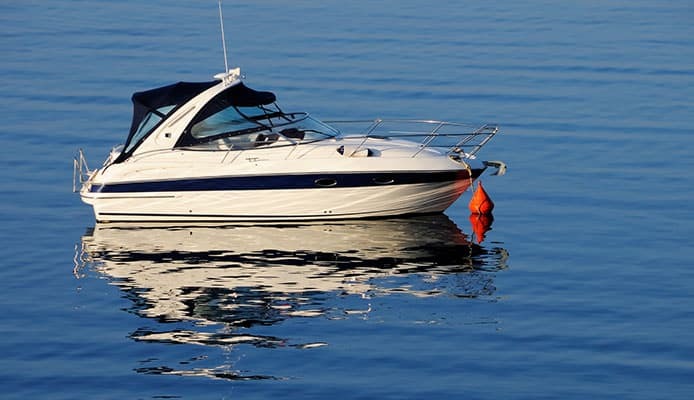 There are many things that can make a boat drift while it’s on the water such as current, tide and wind so it’s vital that you have something in place to keep you still. You might want to stay in the best spot for your fishing trip, stop to cook some food or simply just relax but it’s important not to only have an anchor on board but to find the right one as well. Finding the best boat anchor means taking all the vital aspects into consideration to make the best choice. Whether you’re looking for the best beach spike boat anchor or a river anchor, everything is explained here so that you’re left confident you can make the right choice. So read on, take in the information and then you can cast your anchor out safe in the knowledge it’ll keep you exactly where you want. This is an anchor box will be able to hold onto the surface at a 45-degree angle and is made from galvanized steel. This is great for smaller boats and comes in three different sizes so you’ll be able to find the ideal size for you. This will set into the ground under its own weight and can be easily retrieved and is able to be folded down into a very compact size. This is a highly effective product and its innovative design will mean that minimum effort is required from the user. This is a different system to the fluke layout of the first two products mentioned here. This has two drop forged shackles which will be ideal for dragging along the bottom before securing your boat. It weighs around 7 pounds so it much heavier than the first two options. 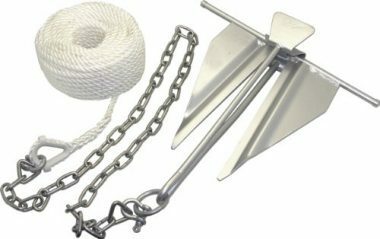 This is an anchor kit and the anchor also comes with 50-foot of twisted nylon rope which is strong and durable. This is ideal for boats just over 10 foot as it will struggle to hold anything 15 feet or longer unless it’s light. This is a compact anchor system which will be able to easily fit anywhere in your boat. Its 4-fluke system will be able to hold in any type of surface including mud, sand, gravel and rock. This is a multi-use anchor and can be taken onto a boat as well as a kayak or a sailboat. If you’re on a smaller boat then this will be able to fit easily into any compartment as it folds up into something that is small and manageable. It comes with a rope length of 26-foot and also comes with a nylon storage case which will keep it safe and secure. 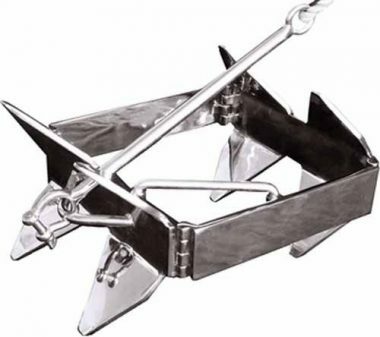 This is a well-designed claw anchor which will be able to dig into the floor and keep you firmly in place. This is another which comes in a wide range of sizes with this one varying from 4.4 pounds all the way up to 44 pounds. This will hold well and can be easily mounted to your boat to give you that anchorage when required. It’s a well-rated product which will be able to give you the hold you need when required. 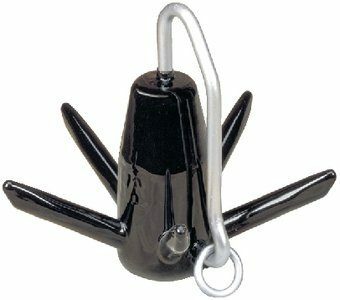 This 4-pound anchor from Fortress is perfect for smaller boats and will hold very well in a range of different conditions and surfaces. These anchors are made from the best material and give a high level of performance. It has an adjustable fluke angle for the best hold and is resistant to rust. 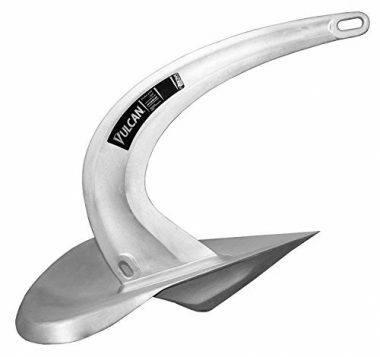 This will be ideal as a second anchor on your boat or as the main anchor on something like a personal watercraft. 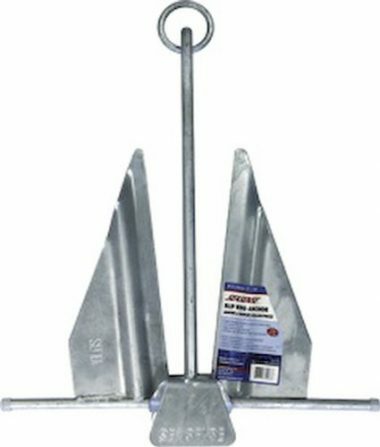 This is a galvanized anchor which will be able to give you a lot of setting power and it comes in a vast range of sizes as you can get one that is just 2 pounds but gives you the option to get an anchor up to the weight of 175 pounds. Due to its flat design it’s easy to store away and its strong build will ensure that it doesn’t fail you. Due to that high-quality they offer a lifetime warranty for the product. If you’re looking for a large anchor for a much bigger boat then this could be the perfect product for you. Rocna here offers a variety of different size ranges from 9 pounds all the way up to 121 pounds with a sizing guide to show you how to make the perfect fit. This has a great and imposing design which will be able to provide a solid hold in all type of conditions. It has an innovative roll-palm has well so the anchor will be able to self-right if it was the wrong way around. The product also comes with a lifetime warranty. This is an anchor which just comes by itself but will be perfect to cast out from your boat with the right length of rope attached. It comes in weights of either 1.5 pounds or 3 pounds so you’ll be able to pick which one will be the best fit for your boat. It’s four flukes are able to be folded inwards so can easily be stored away when it’s not in use. The anchor is made of galvanized steel so it will be resistant to rust. While this not the biggest anchor, it’s perfect for personal watercraft. This slip ring anchor but this one weighs 8 pounds so will be able to hold slightly bigger boats than any of the models previously mentioned here. It’s made of galvanized steel and is quite rust resistant while providing a stronghold. It’s a well-made product which will last for a long time and it is easy to release from the floor. This would be ideal as the main anchor on smaller boats or as a second anchor on bigger boats. This will set and hold even with a 3-1 scope so you’ll be able to stay close to your set point. The black coating will make it resistant to rust. Weight is naturally the biggest consideration when it comes to an anchor as generally the heavier the anchor, the larger boat it will hold. There are size guides available which will be able to show you what size of anchor that you need. The larger the anchor, the more hold it will have but you also need to consider if your boat will be able to hold a higher weight and where it will go. Generally you’d want to opt for the highest weight possible but you should avoid the temptation to get one which is too heavy. 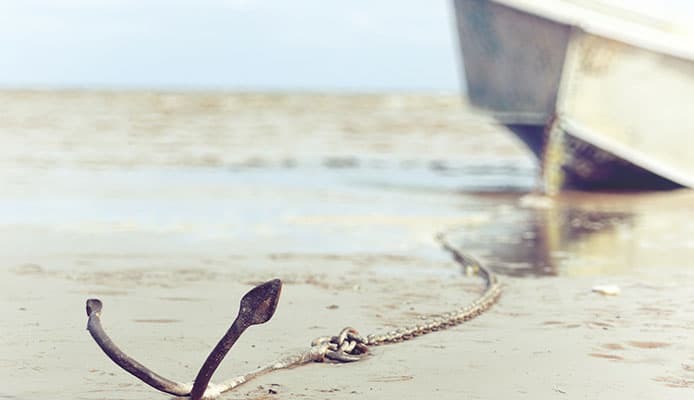 Your anchor is going to be in the water for a sustained period of time so therefore you have to ensure that it’s resistant to any erosion that might occur. This is especially important if you’re in the sea as the salt will be corrosive to any metal that isn’t protected. 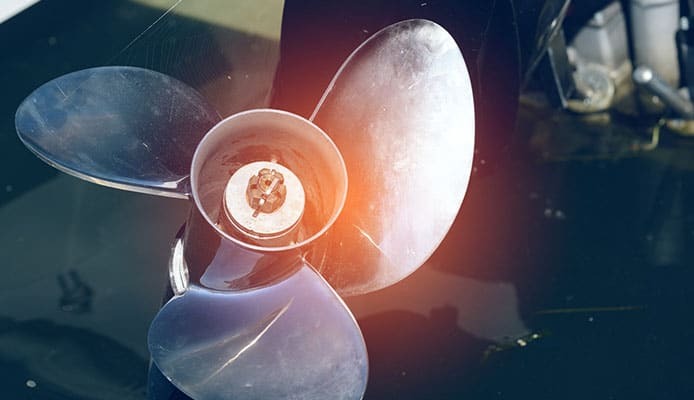 There are two ways that anchors deal with this as they will either be galvanized whereby a layer of non-reactive metal is placed upon it or it will be painted to provide a layer from the water to the metal. The size of the anchor is important in being able to give you the hold you need. The bigger the boat you have then ideally the longer the anchor you need. Thankfully as anchors increase in weight they increase in size and there are plenty of guides available which will be able to show you the size that you need. Weight though is a more important issue though because this is more vital in the holding capacity of the anchor. Holding power is determined as how much your anchor is able to hold onto the bottom of the lake or sea that you’re on. 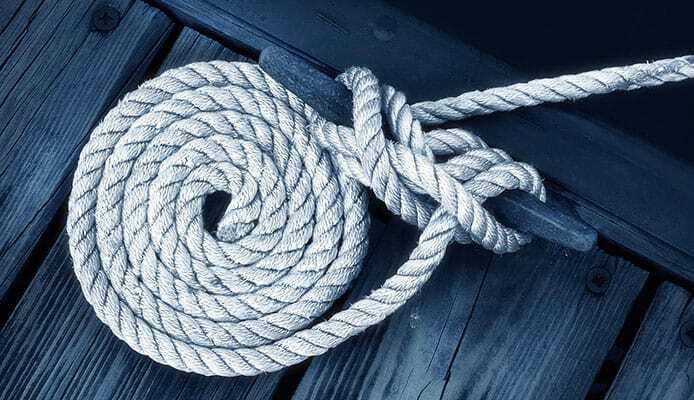 This can depend on many factors such as the weight and size of your anchor as well as the type and length of rope that is used. Other factors matter too such as whether it is holding in sand or gravel etc., and the weather conditions too. 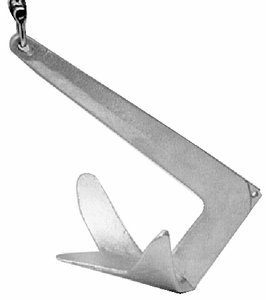 Claw anchor – This is so called because it looks like a claw and will be able to hold in all types of sea bottoms. They can set pretty easily but have a low amount of holding power for their weight. Plow anchor – This anchor is one that looks like the type of plow you’d find on the fields. It performs well in most conditions but struggles in rock and can be difficult to stow. Fluke anchor – This is one of the most popular types of anchor and will be able to perform well in mud or sand but doesn’t perform well in other scenarios. 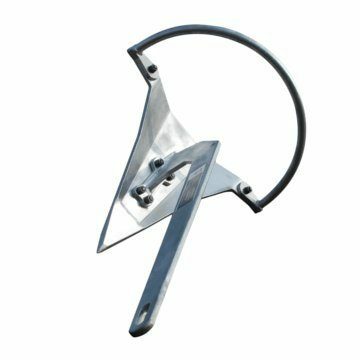 Grapnel anchor – A lot of the products reviewed here are grapnel anchors as they are effective and convenient to carry. They hook onto other objects which makes them great for temporary anchorage. 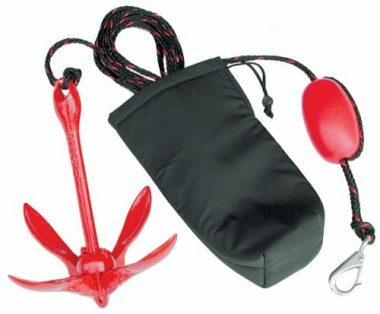 Mushroom anchor – These are generally used as a permanent anchor and can have a holding power of up to 10x its weight. These anchors though are not good for non-permanent moorings. The type of bottom can be important in how well your anchor is going to hold. 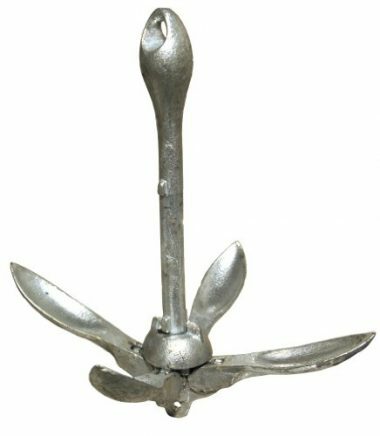 Something like a grapnel anchor will hold well on rocks and others such as a fluke anchor will perform well in mud and sand. If your boat is going to be in one type of place most of the time then it’s important to know what type of bottom it has so you can choose an appropriate anchor. Others like a claw anchor are great for all types of conditions. 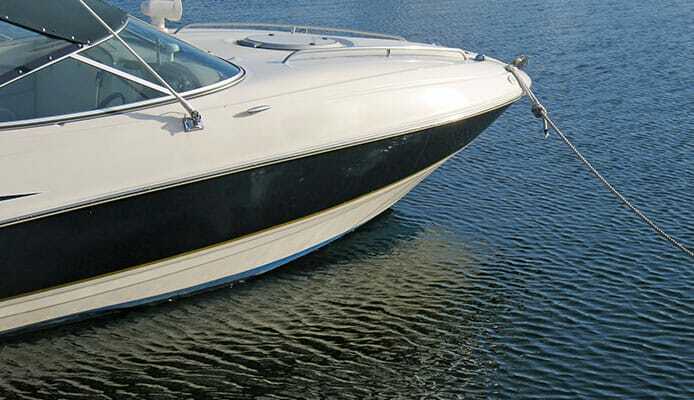 The type of boat that you have is an important factor in what type of anchor that you have. Generally the longer oat you have, the heavier the anchor that you need. Other factors come into play, however, such as space as you want to be able to store it away comfortable. You can check the size of your boat against a sizing chart to ensure that you are getting the right size for your boat. Whatever the size though, make sure that you have an anchor on-board. Most boats will have anchor points at the front, back or both. Some will have a larger anchor at one point and a smaller one at the back. The big no when it comes to anchoring your boat is to now anchor it at the side as this will drag the side of your boat and can leave you vulnerable to capsizing. There is also the option of having a pontoon anchor system whereby you set your anchor up with ropes around your boat so you re able to move around your anchor to find the best fishing spots. Q: Why Do I Need A Boat Anchor? A: All boats need an anchor for a variety of reasons. Some of those reasons are for comfort will other ones are safety. 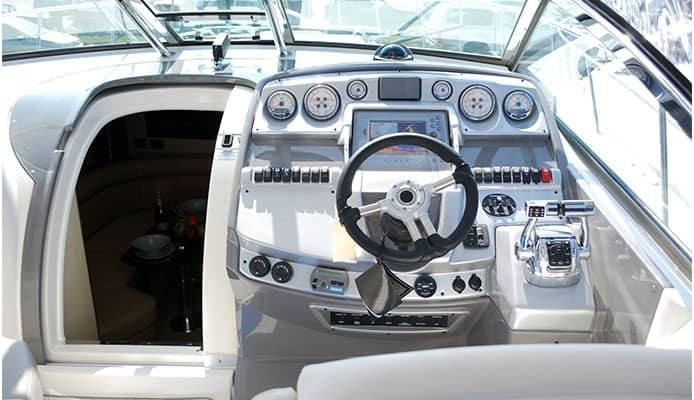 If you’re going to leave your steering wheel unattended then you will need to anchor your boat as there are a number of different forces that can act upon your boat to keep it moving. If you want to do something simple like have lunch or whether you want to stop for fishing then you’ll need to throw out an anchor. It is also useful in times of emergencies where you need to stay situated at one point. Q: Which Style or Category of Anchor? A: The type of anchor that you need depends on the type of boat that you have, how long you want to be moored and what type of bottom you’re going to be traveling over. If you have a larger boat then it could be the case that you need to have two different types of anchor for a temporary mooring and a more permanent one. Each type of anchor has different advantages and disadvantages so you need to check them to ensure that you are getting the right about of holding capacity for your individual situation. Q: What Are The Typical Bottom Conditions? A: The conditions at the bottom of a lake, river or sea can be very different from one to the next. These types also deal differently with different types of anchor. Grapnel anchors for example have their spikes that stick out and aim to grab onto something like a rock or other solid object. 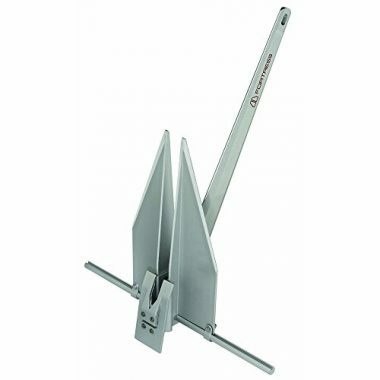 Fluke style anchors are able to dig into the likes of mud and sand to perform a great hold whereas claw and plow anchors are effective at digging in anything that will be on the floor. While bottom conditions can be different wherever you go, if you’re going to be in the same place as the time then it might be a good idea to check those conditions and get an anchor that would be able to match. Getting an anchor is an essential part of your boating equipment. The first part of why one is essential is a matter of safety. Getting your safety equipment on board is essential before you head out on the water and you always want to make sure that you’re set up with a bilge pump, the best life jackets on the market as well as all other vital safety features. The reasons an anchor is so vital to safety are clear as there are a few scenarios where you don’t want to be caught out. If someone needs first aid on your boat then you will want to make sure that you can anchor it and there are other emergencies where your boat had had its power cut and you were drifting. It could be that you don’t have a marine GPS and the fog is too heavy for visibility. Whatever the reason, there are plenty of safety issues which make an anchor essential. Thankfully though most of the time you’ll be using an anchor is simply for a rest, to grab some food or throw out a fine and start some fishing. Before you get that anchor though you need to consider what type of boat you have, what bottom you are going to be traveling over and how long you want to be anchored for. Weight is probably the most important issue when it comes to anchors and there is a general rule that the heavier an anchor, the more it will hold but this can depend on other factors such as the type as well. There are size guides available which will be able to show you how heavy it needs to be and it’s important to check the size and weight to make sure that it can be safely and securely stored on your boat. After weight then you will want to check which type of anchor that you want. Claw and plow anchors are highly effective but can be more difficult to store. Fluke anchors will perform well in mud and sand and are easy to store but generally don’t have a great about of holding capacity. You need to check which type of anchor will be the best for your boat. The temptation is to go for an anchor that has a high degree of effectiveness with a high weight but you need to ensure that this will be practical as well. Check out our marine binoculars, marine speakers and marine stereos to complete your boating experience. Once you know what type you need then you can go out there and buy the best boat anchor for you. Hopefully this buying guide will help you make the perfect choice so you are able to keep your boat still in the case of emergency or hopefully more likely just to relax and spend time on your boat without worrying anything. You can let your mind drift away without your boat doing the same thing.